It all starts with Trileon: a super-light-weight, stable, shock-absorbing closed-cell co-polymer (aka: light rubber compound), that also happens to be odor-resistant. SoftScience employs it in many of their models, resulting in some of most comfortable fishing-specific footwear available. The maker relies on two concepts: #1. a small change in height, from heel to toe, keep your foot more level than regular footwear by distributing weight across several foot zones, and #2. a generous, wide fitting that allows your foot to spread naturally. An excellent option for those with wide feet. The SoftScience Fin Fishing Boot rides 6” high and fastens up or comes off in an instant via a streamlined (snag proof) side zip plus web strap. Mesh upper is extremely well ventilated to prevent heat buildup on a boat skiff. Outsole is extra broad, grippy (but non-marking) and very soft, which reduces vibration when padding around on a skiff (fewer scared fish = increased chances of a hookup). A forefoot water flow system drains and dries quickly. I’ve seen guides sporting these. There are good reasons for that. 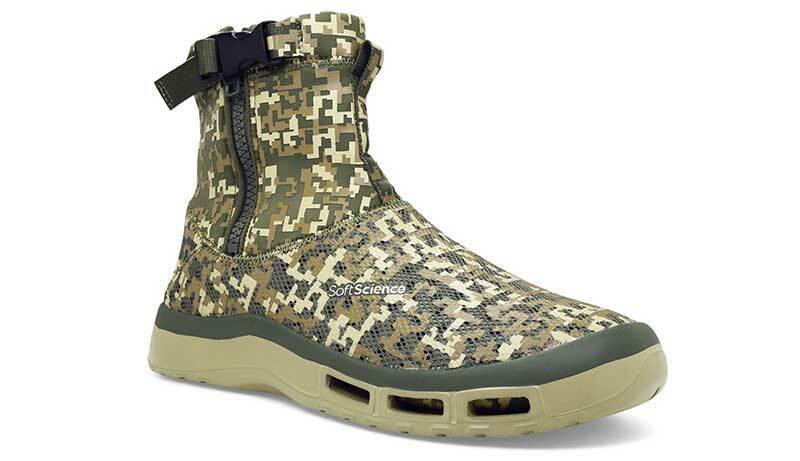 They’re also great for wading soft bottom flats.